It’s 2017, and innovation cuts into literally every aspect of your life, even lazy afternoons spent swilling beer on your couch. The Sobro, a coffee table replete with a beer fridge, USB charging ports, bluetooth connectivity, touch control interface, and many other extravagant features, will guarantee you stay sedentary and content every day of the week. It’s a bro-nafide coffee table revolution. 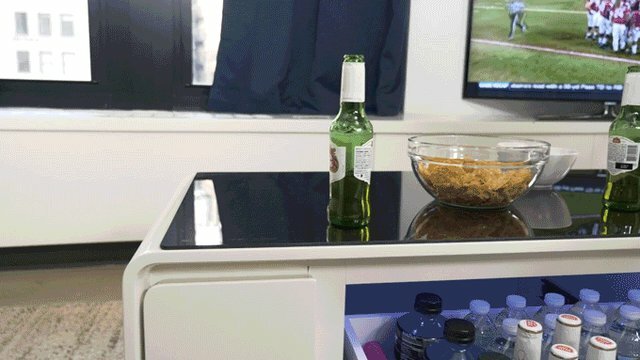 The makers of this lavish product are marketing it to those who live a “digital lifestyle.” But upon closer examination, it caters more obviously to people who enjoy drinking beer and watching a rousing game of sports ball. Think about it: It's called the "So-bro." Unsurprisingly, the Sobro has surpassed its goal on Indiegogo quite easily, garnering 1828% of its $50,000 target. That's just a few dollars shy of $1 million. Check out the table in all of its interconnected, sudsy glory. The fridge offers temperature control features that you can adjust to ensure maximum chill. While it might not be cheap -- the full retail price of the Sobro when it hits the market in September will be $1,500 -- Indiegogo backers can expect a range of discounts if they contribute early. With that morsel of knowledge, you'll surely be at the forefront of chill-tech in no time, bro.